2017 has been a busy time here in Toronto. We recently wrapped Season One of Star Trek: Discovery, providing additional prosthetic effects and artificial bodies for the show. We also created similar effects for season 2 and 3 of CARDINAL, a mini series for CBC. Providing practical creature effects and prosthetic bodies for the feature film The Silence was doubly fun as it was directed by our friend John Leonetti. Recently Roger Avery asked us to create trauma makeup effects for his feature Lucky Day as well. We will be updating on a regular basis so please come back soon! 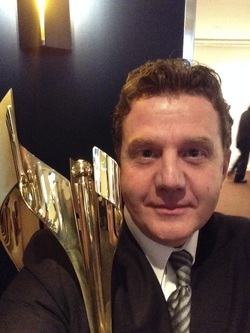 March 9th 2014, Canadian Screen Awards. The Mortal Instruments: City of Bones won in several categories, Visual Effects, Sound Design, Overall Sound and MAKE-UP!!! Congrats to my fellow winners, Karola and Jo-Ann. It was a fun night!